Slashfood: Jello Mistress Caps Off “Lost” with Gelatin Tribute May 24th 2010. Fine Cooking [Best of the Blogs]: There Is Always Room For… June 11th 2010. 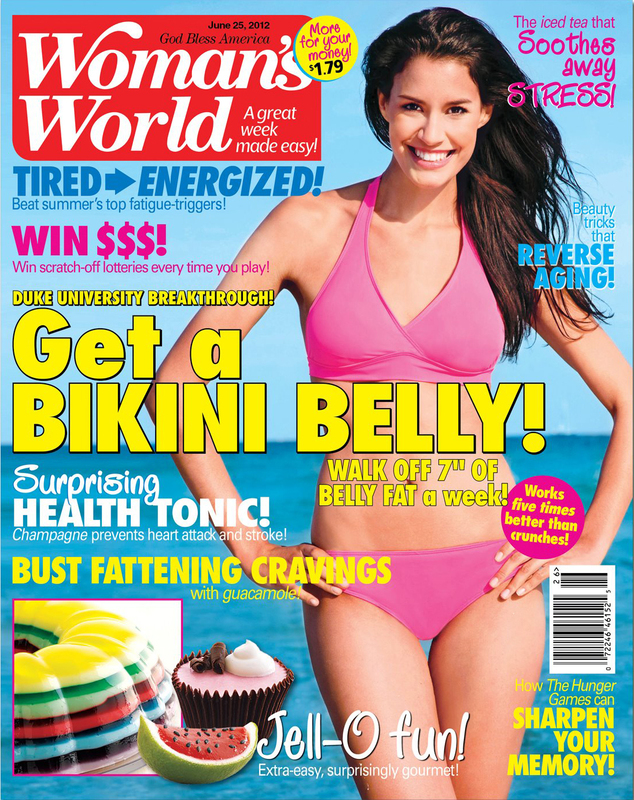 The Globe and Mail: Gelatin gets the jiggle back on Sept 8th 2010. Kitchen Daily: Various recipes created for the site Oct-Nov 2010. Yahoo! Shine: 6 unexpectedly awesome holiday jello molds Nov 22nd 2010. Mental Floss: The Art of Jello Feb 27th 2011. 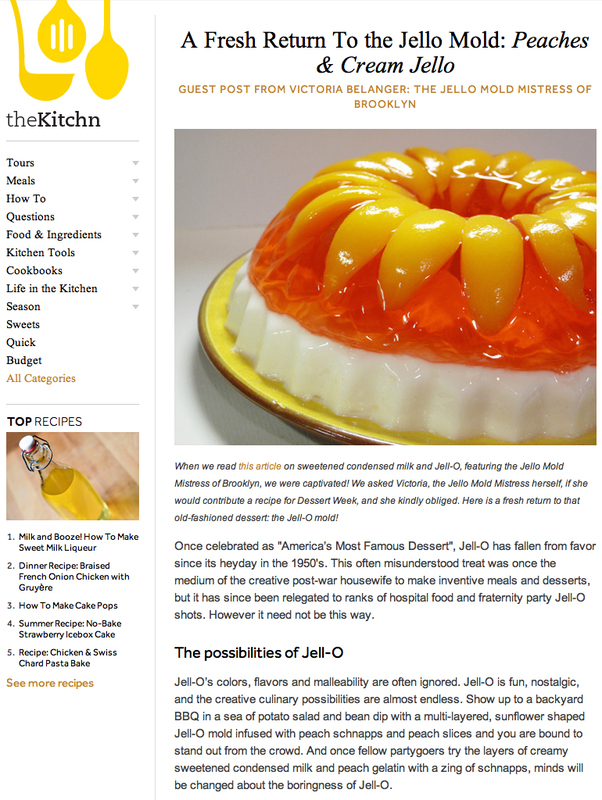 The Recipe Club: Hello, Jell-O! and a Serious Case of Nostalgia Feb 25th 2012. 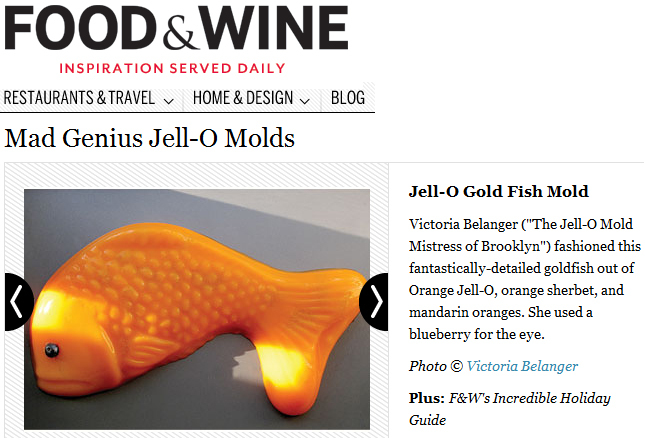 Seattle Weekly: Hello, Jell-O! 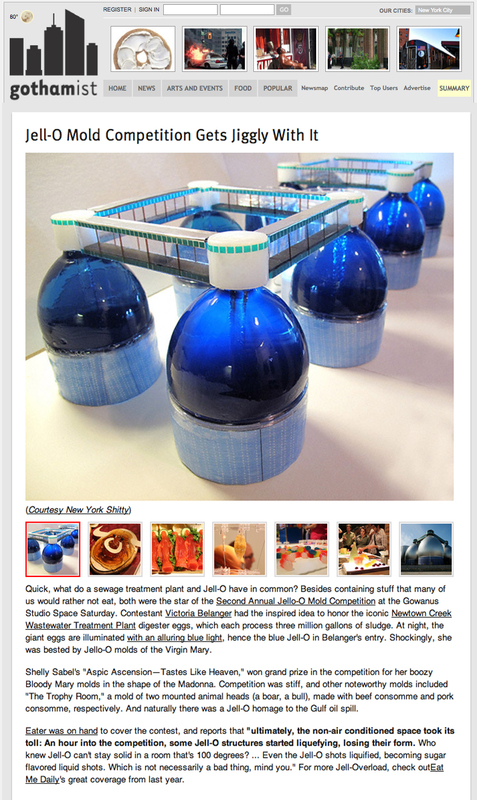 Brings Back the Jell-O Mold Mar 12th 2012. Serge the Concierge: Jello Mold Mistress lifts Veil on Hello Jell-O! Mar 13th 2012. 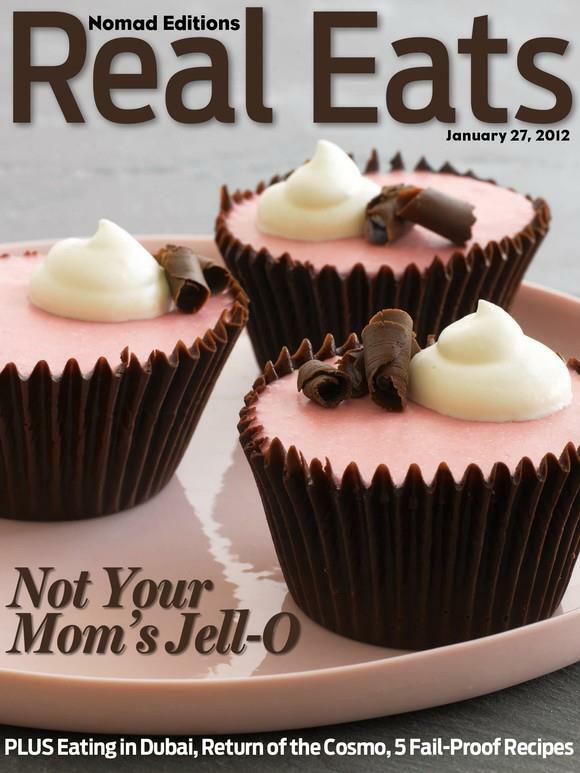 Style at Home Magazine: Chocolate raspberry mousse cups Mar 28th 2012. Color Me Katie: Things that make me oh so happy Apr 13th 2012. The Knot LIVE: VIP Visionary and a Wedding Kids’ Table May 25th 2012. 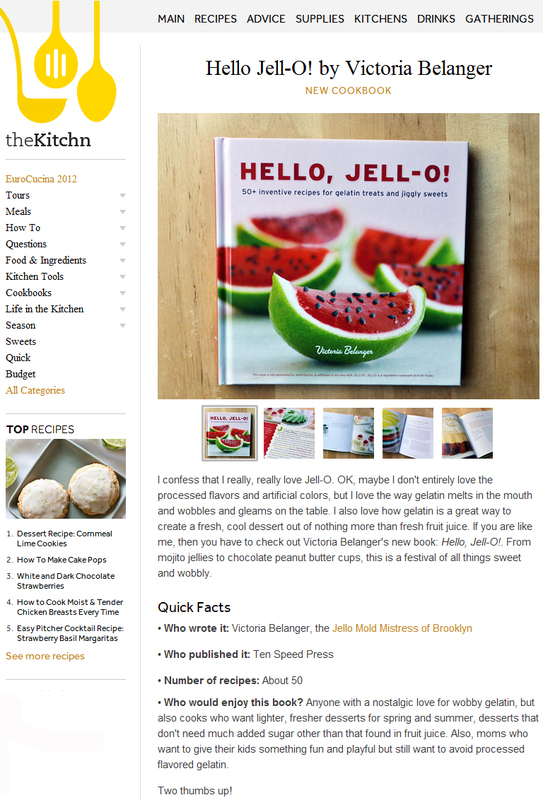 Greenpointers: Hello, Jell-O! The Solution To Summer Dessert Dilemmas June 11, 2012. Marketplace Money Report: Piggy Bank Award June 29th 2012. 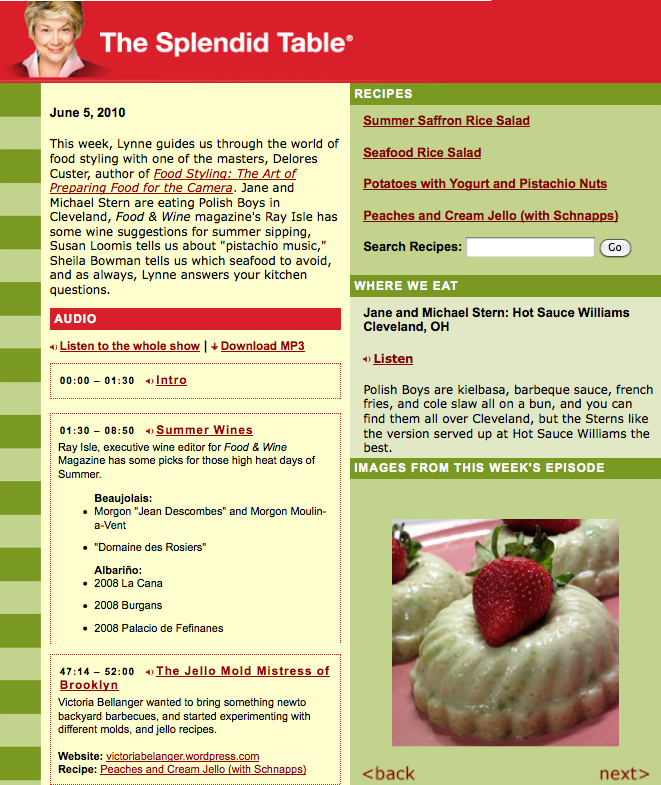 The Cooking Channel blog: Various recipes created for the site June-Sept 2012. Zester Daily: Book Review Aug 23rd 2012. CBS Sunday Morning: Wiggle Room Sept 9th 2012. 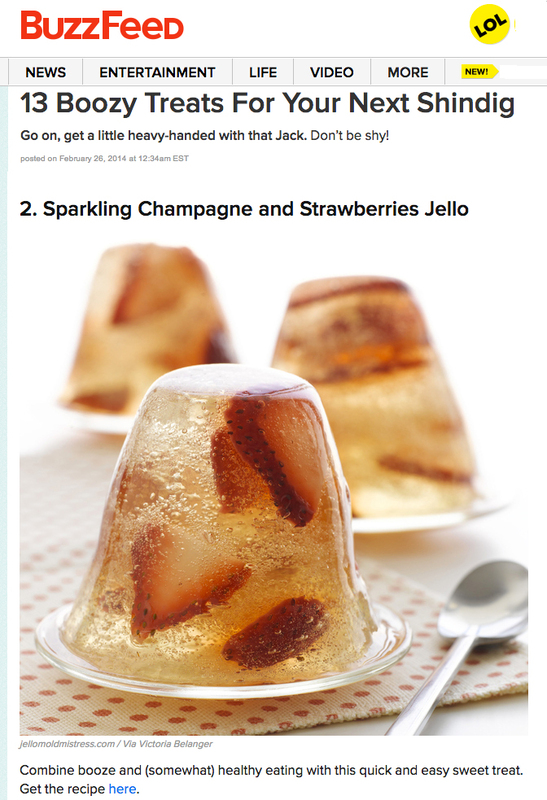 FoodBeast: A NYE Must: Sparkling Champagne Strawberry Jello Dec 11th 2012. 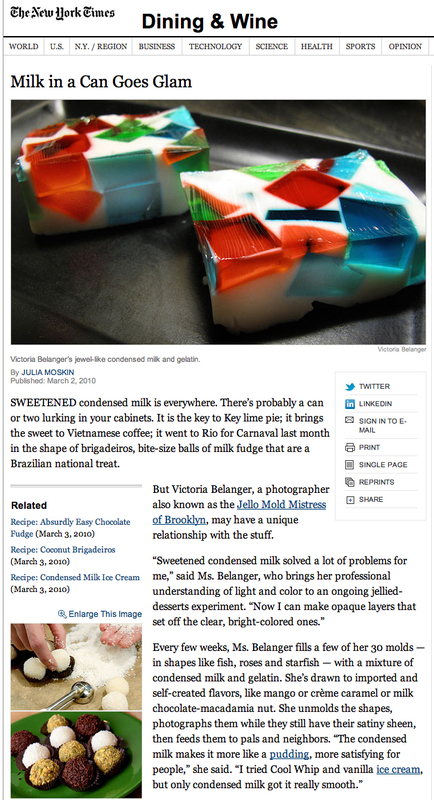 The New York Times: Tongue in Cheek, Aiming at a Sweet Tooth Dec 17th 2012. All Free Copycat Recipes: Hello, Jell-O! Cookbook Review Feb 5th 2013. Make: Magazine: How-To: Cadbury Irish Creme Eggs Mar 27th 2013. Parade Magazine: Petite Watermelons Apr 22nd 2013. 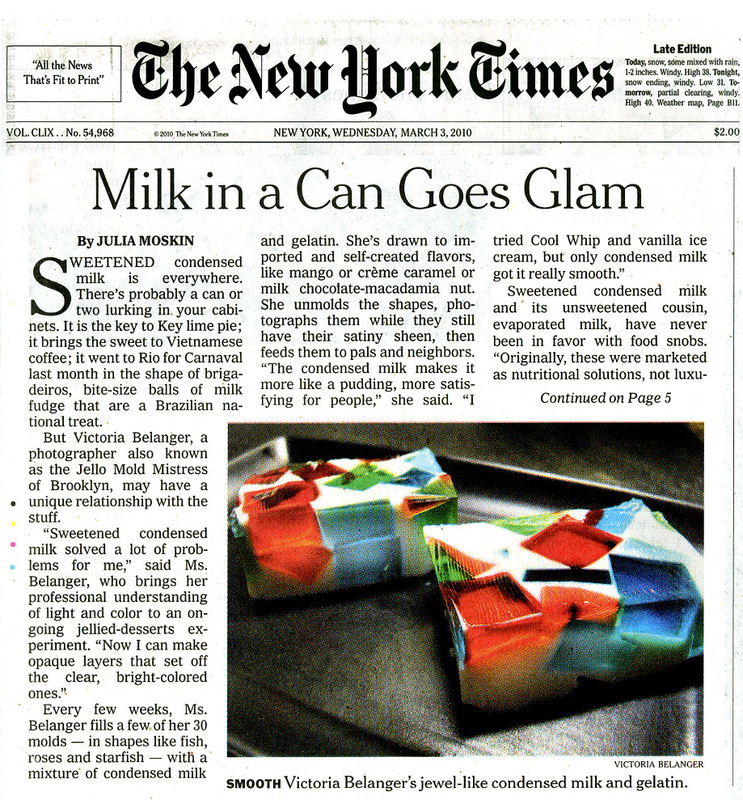 New York Family Magazine: 3 Whimsical Springtime Recipes For Kids May 1st 2013. 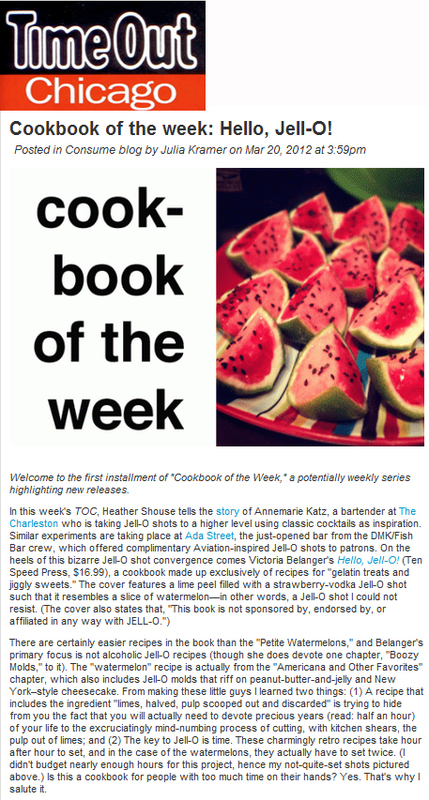 The Roanoke Times: Shaking things up with Jell-O June 12th 2013. USA Today: Tricks for making creepy Halloween Jell-O treats Oct 25th 2013.
eHow: Winter Holiday Jello Mold Recipes Nov-Dec 2013. America Weekend Talk Radio: Meet The Jello Mold Mistress Nov 24th 2013. BuzzFeed: 33 Next-Level Tips For A Bloody Mary Bar Dec 28th 2013. The Nest: 4 Ways to Throw a Pinterest-Perfect Mardi Gras Party Mar 30th 2014. TheWeek: 8 weird and fantastic food blogs May 27th 2014. DIY Ready: Best Jello Shot Recipes May 29th 2014. She Knows Canada: Canadian Flag-Inspired Treats June 27th 2014. Make: Magazine: Tequila Sunrise Shots July 29th 2014. She Knows: 25 Best Jell-O shots … to celebrate New Year’s Dec 29th 2014. Delish: Spread the Love with These 11 Valentine’s Day Jelly Shots Feb 2015. Top Inspired: Top 10 Peach Desserts That Will Leave You Craving For More Feb 14th 2015. Delish: Make Your Own Luck: St. Patrick’s Day Jell-O Shots Mar 2015. 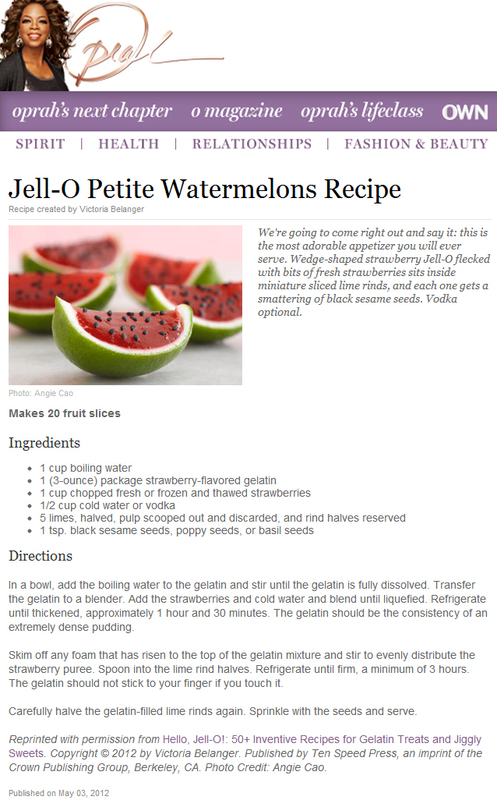 BuzzFeed: 21 Surprisingly Classy Jello Shot Recipes May 28th 2015.
eHow: 11 Red, White and Blue Recipes for Independence Day June 29th 2015. Community Table: 9 Ridiculously Creative Ways to Serve Shots July 1st 2015. Stupid Dope: A New Way To Shoot Jello! Pink Lemonade Shots Sept 21st 2015. BuzzFeed: 15 Fabulous Jelly Desserts You Absolutely Need To Try April 12th 2016. 52Food: Agar Agar is Inconsistent, Wily & Mysterious July 21, 2016. Gothamist: Hamster Rides The 4 Train Dec 1st 2009. 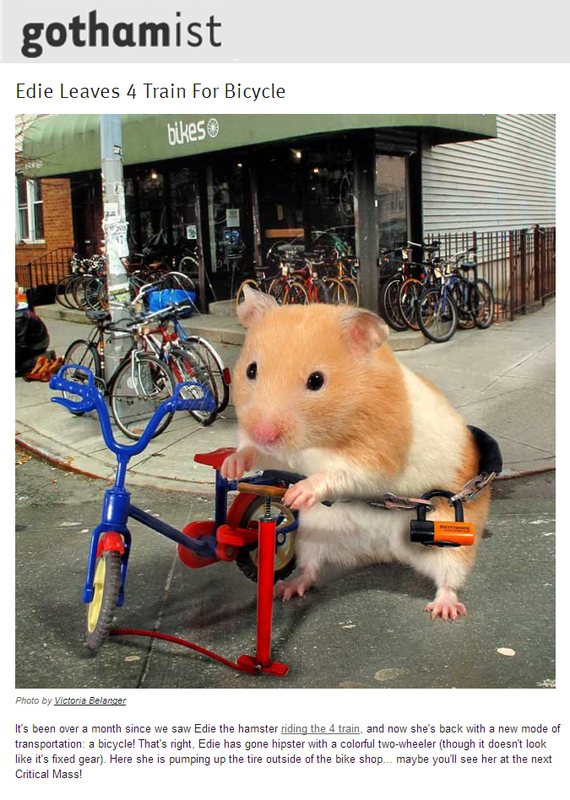 BuzzFeed: Hamster Riding a Tiny Subway Dec 2nd 2009. 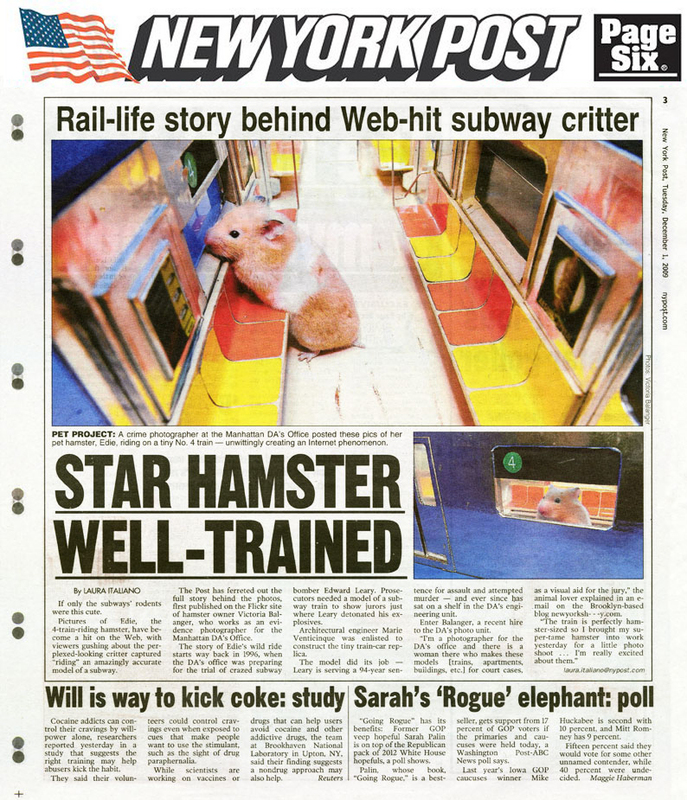 Cute Overload: “The train is perfectly hamster sized…” Dec 5th 2009. PEOPLE pets: Holiday Hamster! Little Edie Poses with Jell-O Mold Dec 15th 2009. 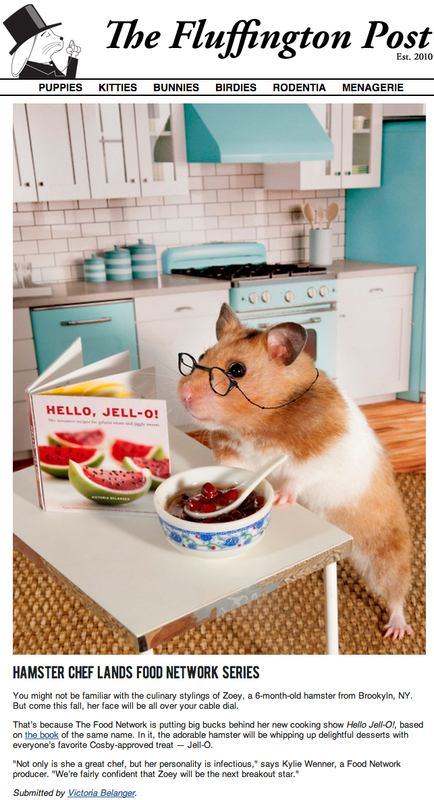 VH1: 7 Photos Of Hamsters Living As Small Furry People Mar 21st 2012.